It was a case of incredibly bad timing on the part of CBS News. On the same day we learned that there had been a massive leak of classified information engineered through President Obama’s CIA, the CBS Evening News with Scott Pelley featured one of Obama’s former CIA directors arguing that Trump was being irrational by criticizing the intelligence community. Obama’s former CIA director, Leon Panetta, wondered about the “trust of the American people in the credibility” of Trump, when his own credibility was in question. The bizarre spectacle was another indication that the liberal media have come completely unglued over President Trump’s unorthodox way of doing business in Washington, and his willingness to confront the issue of corruption in the intelligence community. The question, in the wake of the WikiLeaks disclosures of some of the CIA’s most important secrets, should have been what Leon Panetta and other Obama CIA directors, such as John Brennan, were doing when all of this classified information was being stolen. It is apparent that CBS and other media organizations are too close to the intelligence community to question what is really going on. Indeed, in retrospect, it might seem proper to ask whether the anonymous sources in the intelligence community leaking derogatory information against Trump are trying to divert attention away from the infiltration of their own ranks by agents for Russia, China, or other American enemies or adversaries. How can the charge be “unproven” when the liberals’ favorite newspaper, The New York Times, covered the use of “wiretapped data” against Trump, and Washington Post columnist David Ignatius reported on private conversations involving former national security adviser Michael T. Flynn? Does CBS think the American people are stupid? No wonder the people trust Trump’s tweets over fake news from the media. Under Obama, a series of moles in the intelligence community have been uncovered, including Army intelligence analyst Bradley/Chelsea Manning, CIA/NSA contract employee Edward Snowden, and now, with the WikiLeaks disclosures, another “anonymous” leaker has come forward. The latest came when Obama was president and Brennan was CIA director. The documents are only being released now. To make matters worse, and to show his disdain for the concept of protecting America’s secrets, Obama commuted the espionage sentence for Manning, facilitating his release from prison on May 17 of this year. Manning’s treachery “put American lives at risk and exposed some of our nation’s most sensitive secrets,” noted House Speaker Paul Ryan (R-WS). But Manning was in the process of changing from a man to a woman, after having served openly in the Armed Services as a practicing homosexual. So he was special and different. Obama’s commutation was a “dangerous precedent,” Ryan noted, which indicated that those who “compromise our national security” won’t be held accountable for their crimes. 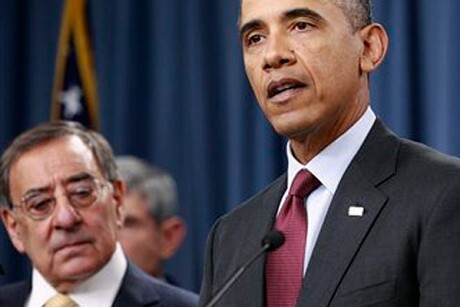 Obama, who couldn’t have passed a background check, nominated Panetta as CIA director in 2009. Panetta served two years in that position, and went on to become Secretary of Defense. He started his career in the Democratic Party as a far-left congressman from Santa Cruz , California, with a laundry list of connections to communists and socialists, including suspected espionage agent and Communist Party member Hugh DeLacy, himself a one-time Democratic member of Congress. As noted by journalist Wes Vernon, researchers found a “Dear Hugh” letter from then-Rep. Panetta that offered a summary of a report on U.S. military operations unavailable for public distribution. In the letter, Panetta wrote, “If there is anything I can do for you in the future, Hugh, please feel free to call on me.” When DeLacy passed away in 1986, Congressman Panetta spoke at his memorial service. Panetta also had deep links to the Marxist Institute for Policy Studies in Washington, D.C.
Panetta was followed as CIA director by David Petraeus, who was convicted of mishandling classified information, and then John Brennan, who voted communist before joining the CIA and reportedly converted to Islam while stationed in Saudi Arabia. “The new leaker may very well have been hired as a result of CIA Director Brennan’s decision to lower standards for CIA hiring because he wanted to create a more diverse CIA workforce and Brennan rushed to staff his new cyber office,” commented former CIA analyst Fred Fleitz of the Center for Security Policy. Brennan promoted the hiring of transgenders and pioneered a multi-year “Diversity and Inclusion Strategy (2016 – 2019)” for the agency that is still in effect. A different approach might have been to hire people based on their love of country and loyalty to the Constitution. Trump’s “outbursts” seem mild compared to the records of disaster and destruction of American national security that characterize the tenure of Obama’s CIA directors. Pelley hyped the fact that Panetta was CIA director when Osama bin Laden was killed, although his al-Qaeda successor, Ayman al-Zawahiri, is still on the loose, and al Qaeda has proven to be a resilient organization that President Trump has had to target with military might in Yemen. Reportedly, the FBI is investigating the leak from the CIA. But as we have pointed out on numerous occasions, the FBI still hasn’t solved the post-9/11 anthrax attacks, despite evidence that al-Qaeda infiltration of U.S. labs explains why the anthrax that was used to kill five Americans was made in the U.S. The entire intelligence community, including the FBI, seems to be thoroughly infiltrated and compromised, and unable to identify the nature of the corruption that constantly eats away at U.S. national security. Panetta frets about Trump’s “credibility” on the CBS Evening News with Scott Pelley when Panetta and the president he served had none to begin with. All of which proves Trump’s claim that the media are the enemy of the people.